Free from known allergens. Suitable for vegans. Suitable for vegetarians. 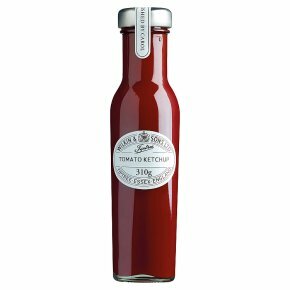 Suitable for coeliacs.A very special tomato ketchup (or sauce as it's also known), a recipe that's been a Wilkin family favourite for over a hundred years, the finest Mediterranean plum tomatoes, prepared with expertise and care; each jar individually finished and checked before packing.